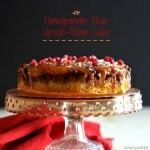 Pomegranate Pear Upside-Down Cake is a versatile, delicious cake to make with most seasonal fruits & served with or without ice cream. Bet ready for it to be the star of the show. Grease a springform or 9-inch cake pan with shortening or spray with cooking spray. Tart pans can be used. Cover the bottom and sides with parchment paper. Place pears flat side down, pomegranates and all other ingredients for the poached fruit in a medium saucepan and bring to a boil.` Simmer, stirring occasionally, until the pears are slightly undercooked, approximately 6-10 minutes. Check with a sharp knife - they should be tender on the outside and slightly firm on the inside. Once the pears are almost cooked through, turn off the heat and set the poaching fruit aside to cool until ready to use. Combine ¾ cup brown sugar and 6 tablespoons butter in a small saucepan over medium heat. Cook and whisk often until butter is melted and mixture is thoroughly combined – 5-6 minutes. In a medium bowl, sieve together ground almonds (or almond flour), all-purpose flour, salt, cinnamon, nutmeg and star anise; set aside. While using the paddle attachment of a mixer, cream together butter and sugar until light and airy – approximately 3 minutes. Gradually add the eggs and vanilla extract – mix until well combined. Add the flour mixture, orange zest and lemon zest and mix just until combined and smooth, but don’t over-mix. In a microwave-safe bowl, bring the jam and water just to a boil, mix well, then pour the glaze over the warm cake. Pour caramel mixture over the bottom of the pan. Strain the fruit from the poaching liquid then remove the pears and pomegranates from the other ingredients. Spoon out the core of each pear half then slice them lengthwise into 5-6 slices per half pear. Place 1-cup pomegranate seeds and pears in a pattern of your choosing over the caramel mixture. (reserve any extra pomegranate seeds for garnishing the baked cake). Carefully, and without moving the fruit, pour the cake batter over the fruit and smooth out the top. Place the uncooked cake on a parchment-covered or foil covered cooking tray to catch any drippings while cooking. Bake at 350F for 45-60 minutes or until tester comes out clean. When the cake is still warm but not hot (15 minutes), place an upside-down serving plate over the cake and quickly invert the cake onto the serving plate. Garnish with extra fresh pomegranate seeds. Drizzle the cake with glaze, if desired*. Let the cake cool completely on a cooling rack before serving. Cake will keep in an airtight container in the fridge up to 3 days.